(10-08) 04:00 PDT Mount Athos, Greece -- Welcome to the Monastic Republic of Holy Mount Athos. Please set your calendar back a thousand years. Clocks here run on Byzantine time, which starts at sunset. Dates are calculated according to the Julian calendar of the Roman Empire, which varies by 13 days from the modern Gregorian calendar you're used to. Some settlements are supplied solely by mule teams, and the flags of Byzantium still fly. Radio? Television? Newspapers? Paved roads? If they didn't exist in the year 972, you probably won't find them here. And if you're a woman, you'd better make other plans. Females have been strictly forbidden here for a thousand years. Not even female animals are permitted. Mount Athos is an Eastern Orthodox monastic republic and a surviving administrative unit of the Byzantine Empire -- a fully functioning mini-state with roads, settlements and a capital city, all operating under a charter granted by the Byzantine Emperor at Constantinople in 972. That world is preserved here in astonishing detail and texture. Clothes, music, roads, public fountains, aqueducts, arched stone bridges, vegetable plots -- all are from another age. Even the shiniest new chapel is built with traditional Byzantine-style brickwork, the product of a living culture. Legally speaking, Mount Athos is an autonomous region in northeast Greece, with many characteristics of an independent state. Visitors must show passports on the way in and undergo customs inspections on the way out. Psychologically and geographically speaking, it's a world apart. It's perched on a hilly, heavily forested peninsula -- 6 miles wide and 35 miles long -- that terminates in the peak of Mount Athos itself, a sharply pointed, bare rock, 6,700 feet high that drops steeply into the Aegean. Scattered over this rugged landscape are 20 large monasteries, a dozen smaller communities, innumerable hermitages and 2,500 monks. The whole place is reachable only by boat. This exotic little state has many features of a truly great travel destination: grand architecture, hiking trails along cliff tops or through virgin forests, guest rooms in monasteries, meals of fresh, natural foods and a chance to talk with wise and thoughtful men about the nature of the good life and the state of your soul. And no one can justly complain about the price: In the tradition of monastic hospitality, each monastery offers two meals and a night's lodging for free, then sends you on your way. 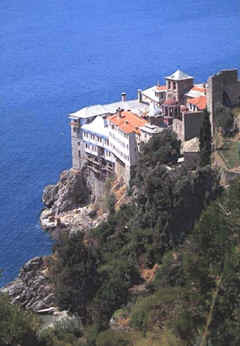 You can spend a week at Mount Athos, as I recently did, without spending a dime. That is, if they'll admit you in the first place. Mount Athos guards its isolation and discourages casual visitors. To be admitted, I had to prepare a letter for the central Pilgrims' Bureau explaining why I wanted to go there. Fortunately, I had a decent reason: After years of legal practice, I was ready for a seriously nonmaterialistic pilgrimage. I was granted one of 10 permits issued each day for non-Orthodox visitors. Mount Athos is the spiritual center of the Eastern Orthodox world. Visitors need not be Orthodox themselves, but having religious or spiritual purposes in mind will help them get in. I got permission to visit Mount Athos last May and entered, as most visitors do, through the town of Ouranopolis, a honky-tonk resort 75 miles east of Thessaloniki. This is the end of the road from the outside world. I showed my entry papers and boarded a ferry for the two-hour ride along the coast to the little town of Daphne, the port of Mount Athos. From Daphne, visitors can transfer to another ferry that serves the monasteries farther along the coast, or set off on one of the walking trails, or use the simple but efficient system of buses and minivans. The ferry is more pleasant than the minivans, since it cruises only a hundred yards or so off a beautiful coastline and doesn't throw up clouds of dust. But the best plan is to leave public transportation entirely before reaching your destination, and walk the last couple of hours to get into a proper pilgrim's frame of mind. That's what I did. The most striking piece of architecture is the monastery of Simonopetra, where I stayed the first night. It sits on an outcrop of rock a thousand feet above the sea and rises like a fortress, with the bottom 40 feet of its walls blank stone. The topmost floors, however, are quite dramatically open; four stories of decidedly rickety-looking wooden balconies run all the way around the building. Walking on the balconies provides an early test of one's faith and serenity. There are gaps between the floorboards, and it's a long way down. Like most of the monasteries, Simonopetra is filled with the sounds of heavy renovation. Just 30 years ago, it appeared that Athos was about to die out. The buildings were in disrepair, and most of the monks were old. Today, however, the average age has fallen to something closer to 40, young monks are common and many of the new entrants are highly educated. One is a former Harvard professor. This turnaround is attributed in part to the arrival of a new generation of charismatic leaders (some of them fleeing from places, like Meteora, that had become too touristy for monastic practice), and in part to organizational changes that shifted several monasteries to a more communal and tightly organized way of life. At Simonopetra, I began to learn the basic routine on Mount Athos: A monk passes through each monastery courtyard at 3:30 a.m., tapping a distinctive rhythm on a wooden board called a talanton to wake everyone for 4 a.m. services, which begin in total darkness and run for three hours as the candlelit church slowly brightens into daylight. After breakfast, there's a ferry ride or a few hours' hike to the next monastery for a meeting with the host monk, who greets visitors, offers the traditional welcome of jellied candy and cool water and explains his monastery's layout and schedule. Ninety percent of pilgrims are Greek, but most guestmasters speak at least a little English. Then there are a few quiet hours to explore, talk with the monks, attend afternoon services and have dinner. After more free time and an early bedtime at 9:30 p.m., a visitor enjoys the smooth and easy sleep of a stress-free life. At Simonopetra I also encountered the role that relics play in Orthodox tradition. The monastery had many, including what is said to be the left hand of Mary Magdalene. Those could be kissed, or touched by crosses that the visitors had brought with them. In two of the monasteries I visited, the monks showed me vaults containing the skeletons of deceased brothers. The practice was to bury bodies in the ground for a few years, and then to transfer the bones to the vault. My next day's destination was the Danieleon -- not a monastery, but a free-standing house for five or 10 monks, located at the extreme end of the peninsula in a rugged area without roads. I caught a ferry, then toiled up a series of steep switchbacks under the hot sun for an hour. Then, at last, relief: a terrace, a walkway under a cool and shady arbor, flower beds and a view over the Aegean. The monks at the Danieleon are famous for their expert chanting. They start in the morning darkness, in a little chapel dimly lit with a few small olive-oil lamps, some shining through containers of colored glass. They're shadowy shapes, nothing more. But in this darkness comes a sonorous, complex, humming harmony of many voices, soothing and otherworldly, a perfect accompaniment to three hours of meditation. Not everything was sweetness and light. At dinnertime the night before, I had been sent outside with the command "exo, exo" ("out, out") and ate by myself at a table on the terrace. This was presumably because I was non-Orthodox. The non-Orthodox are sometimes sent to secondary places on Athos, particularly during church services. However, the monks did invite me into the chapel for the morning service, which was the important thing. The monasteries varied widely in their approach to this issue, with some involving the non-Orthodox on equal terms, some seating them in the outside hall and some keeping them farther back in the church porch -- the exonarthex. In all cases where a distinction was made, however, it was done kindly and with the explanation that there was an injunction against praying with people who were not members of the church. Next on my journey was Grigoriou, a midsize monastery on the rocks just above the sea. It's noted for the friendliness of its monks; benches and kiosks on the grounds are arranged for easy conversation. Visitors gather around the monks in twos and threes, talking quietly, often comparing Orthodoxy and Western Christianity. A novice at one of the monasteries -- a former teacher of classics -- explained that Catholicism has an important intellectual tradition, as exemplified by the Jesuits, while Orthodoxy is more "a religion of the heart." It tries to induce spirituality through more directly aesthetic means, such as the chants, incense, candles and, most important, the services in the quietest hour of the night when the heart is most open. Monastery food is always plain and fresh, but varies in its sophistication. Some places serve a simple bowl of lentils; others offer artichoke hearts in lemon sauce. Dinner at Grigoriou ended with an excellent chocolate torte. The monastery of Vatopedi is at the worldly end of the scale. It's one of the largest on the mountain, with a courtyard that looks like the center of an Italian Renaissance town. One of the monks told me that Britain's Prince Charles, a regular visitor to Mount Athos, had been a guest there earlier in the month. Vatopedi stands in an area of rolling agricultural land, rather than on steep cliffs. An easy walk leads past farmhouses and along country lanes, where a sense of bone-deep peace lies on the land. You can hear the rush of birds' wings and the hum of bees in a flowering tree. I was reminded of a conversation a few days previously with an English monk named Father Damian, who had stopped by Grigoriou as a visitor and ended up staying there. He recommended the line from Psalms, "Be still and know that I am God." As my week wound down, I realized that a kind of spiritual detox had taken place. I felt I had been on Mount Athos long enough when I began to look forward to the pre-dawn ritual, when I accepted with contentment whatever portion of food was offered and when I felt no particular compulsion to learn the latest news. I did, however, miss the reliable hot showers of the outside world. On the way back to the ferry and the mainland, I passed through the town of Karyes, the administrative seat of Mount Athos and, with a population of about 350, surely the smallest and dustiest capital in Europe. The main street has a few general stores. Pack mules are a common sight. But I was able to buy a candy bar there. Arriving back in Ouranopolis, I experienced a brief culture shock: Women! Children! Cars! Crowds! I soon adjusted, but the memory of Athos lingered. And I had packed a Byzantine flag as a souvenir. Notably absent from the Mount Athos landscape is the feminine touch. Partly this is a consequence of monastic status, for Mount Athos is basically a cooperative of private monasteries. Another reason is a belief that Christ gave the peninsula to his mother, Mary, to be her private garden, and other women are excluded to more distinctively honor the Virgin Mary. The exclusion of women is, naturally, controversial. The European Parliament has endorsed a report containing a paragraph that suggests this is a violation of women's rights. The Greek government has responded that the special status of Mount Athos was recognized in conjunction with the treaty by which Greece joined the European Union in the first place. There have been a few exceptions to the ban. During the Greek Civil War, Mount Athos granted sanctuary to refugees, including women and girls. And in the 1930s a Greek beauty queen named Aliki Diplarakou, who had won the Miss Europe title, dressed up as a man and sneaked in. For the male visitor, there are some benefits. The absence of women seems to ease communication among the men and to heighten introspection by removing, not sexual tensions precisely, but a layer of social complexities that would otherwise demand attention. The ban also protects a shared mood among the visitors, who are willing to focus on the spiritual experience and share that bond. Many fear that if the ban were removed, Mount Athos would become a tourist destination like any other, its distinctive atmosphere lost. From San Francisco, Lufthansa and United offer one-stop connecting flights to Thessaloniki, Greece. Or fly to Athens and catch a Hellenic Railways express train to Thessaloniki, about a 4 1/2-hour ride; trains leave almost hourly. From Thessaloniki, it's a two-hour bus ride to Ouranopolis, about 75 miles east of Mount Athos; buses leave every few hours. In Ouranopolis, ferries take male visitors to Daphne, the port of Mount Athos; reservations and an entry permit (see below) are required. Women and others unable to visit Mount Athos can view the monasteries from the sea on tour boats out of Ouranopolis. Mount Athos Pilgrims' Bureau, 109 Egnatia St., GR-54635 Thessaloniki, Greece, 011-30-2310-252578. Gives entry permits for Mount Athos, which admits about 120 Orthodox and 10 non-Orthodox visitors per day. Friends of Mount Athos, abacus.bates.edu/~rallison/friends. Source of current, detailed information on visiting. Some monasteries now require reservations; check the site for listings and phone numbers. Note that the Monastery of Simonopetra is closed through the end of this year because of renovation work. Neil Averitt is a lawyer in Washington, D.C. To comment, e-mail travel@sfchronicle.com. You can read an update from a case worker who is still slugging it out in the trenches, but who is about ready to give up by clicking here, and then here. Then there is the following update on how this impacting the people who depend on these benefits. You can watch a video report by clicking on the above link, and then clicking on the link in the upper left hand corner. Since August of last year the state has been paying a private call center contractor millions of dollars to process public assistance applications. Yet many East Texans continue to wait for a few dollars worth of funding to buy food. State workers who lost their jobs to privatizations are blaming the company's poor performance. The contractor says it just takes time to process the claims in an accurate manner. Stuck in the middle of the political battle are East Texans needing food for themselves and their families. The region isn't directly, but rather indirectly affected by the debate over privatization. The call centers don't serve East Texas. According to a DHS spokesperson the method was never rolled out to East Texas because of problems the contractor had earlier this year. However, state workers in the local office had already quit and moved on to other jobs. Temporary workers were hired for the Lufkin office to handle the resulting backlog. The spokesman says the average wait time for benefits is now at 18 days. But clients speak of longer waits. Timothy Fancher is one. His body has the disabling affects of cerebral palsy. He's wheelchair bound, legally blind and never worked. For the first time he applied for food stamps after his wife became disabled. To the couple's surprise he was denied because he didn't have a job. "I couldn't believe it. I've never worked before in my life and I couldn't believe it. They wanted me to go to work," said Fancher. A form letter said he must work at least 20 hours a week or enter a job program. Fancher says he received mixed messages from DHS leading to dismay. Fancher recalled, "She said, 'Mr. Fancher, I don't see no problem. Then we get a letter we were denied because I'm able to work. That don't make no sense." The Christian Information Service Center provides food to the Fanchers and hundreds of others caught in red tape. Director Linda Smelley said, "Everyday, everyday there's a story and you don't forget them. They're not numbers. They're people with major problems." They're elderly, single parents and hungry. All are required to maneuver an automated phone system when sending in applications or while making inquiries. Some give up in frustration. Some can't even afford the phones to make the call. There's no face to face contact with a representative. Since privatization over 130 new applicants walk in a month to CICS. Sandra Pena, a single mom of four sons holds down two jobs. The state told her food stamps would arrive last Monday, but they didn't. "They've been avoiding my calls. I leave numbers, but no one returns the calls." Pena was buying milk on credit at the convenience store where she works. The she learned about CISC. "The lady I'm with she's the one who told me about it. If this place wasn't here my kids wouldn't have nothing to eat." Rep. Jim McReynolds of Lufkin joins about 50 state leaders who are hesitant to renew any private contracts. "At this point in time the system has failed. We ought to set that contract aside, got back to session and figure out what we need to do." McReynolds serves on the health committee. In the meantime, non profit service agencies are overwhelmed physically and financially helping those waiting for state assistance. Smelley wants to avoid the political conflict. "They can get it straightened out. They can fix it, but we've got to feed the people while they're doing that." I guess they proved the Pope wrong, huh? Funeral held today. Captors demanded public apologies for Benedict XVI’s Regensburg address and payment of US$ 250-350,000 ransom. Christians are enduring more brutal violence; a 14-year boy is crucified. Mosul (AsiaNews) – Fr Paulos Eskandar was laid to rest in Mosul today. The decapitated body of the Syrian-Orthodox priest was found in an eastern district of this Iraqi city yesterday. He was abducted last Monday by an unknown Islamic group which posted a hefty ransom of 0-350,000, the Assyrian International News Agency (AINA) reported. The group also demanded that signs be posted on his church apologising for the Pope's Regensburg remarks as a pre-condition for negotiations. Linda Smelley, executive director of CISC, stands next to a table loaded with jars of peanut butter and piles of snacks destined for the Backpack Buddy program, feeding poor school children who would normally go without adequate food at home over the weekend. The hungry are tightening their belts in Angelina County as state social service cutbacks leave them waiting up to 40 days for food stamps, according to the director of the largest food bank in the county. Hungry people arriving at her door are often stuck in a bureaucratic no man's land, said Linda Smelley, executive director of the Christian Information and Service Center. The center is funded by grants and donations from citizens and churches. Charles Lennox, 22, who suffers from cerebral palsy, works sorting cans at CISC every day, accompanied by his mother, Patricia. The family is giving to others in return for the help they got, Linda Smelley, CISC executive director, says. Many people don't meet the state's complex formula for "emergency need" status, or a crisis situation has pushed them to a desperate level, beyond the state's response capability, she said. Like the mother who didn't qualify for emergency help — grocery debit cards handed out within 24 hours — because "on paper" she was getting child support, meaning she had too much income. "But she hadn't been getting it. If the check doesn't come, her kids go hungry," Smelley said. Boxes of food await distribution at CISC, the largest food bank in Angelina County. Linda Smelley, executive director, says cash donations are desperately needed to offset the influx of emergency food handouts to people on lengthy food stamp waiting lists. Qualifying for an emergency card means a person is not merely in crisis, but among the poorest of the poor. It's a situation that state Rep. Jim McReynolds (D-Lufkin) described last week as "horrible." "You can't make more than $150 a month, or have liquid assets of more than $100. You really have to be homeless," he said. That leaves many hovering between homelessness and stability to fall through the cracks, waiting for benefits to come through. A mother of four arrived at CISC two weeks ago looking for help. She'd planned to squeak by waiting to qualify, trusting her children would get free breakfasts and lunches through a school program. But all four came down sick, and had to stay home. Boxes and baskets of produce, bread and canned goods wait to be handed out in the daily food distribution line at CISC. Staff photo by Joel Andrews. In center photo, Charles Lennox, 22, who suffers from cerebral palsy, works sorting cans at CISC every day, accompanied by his mother, Patricia. The family is giving to others in return for the help they got, Linda Smelley, CISC executive director, says. In photo at right, Linda Smelley, executive director of CISC, stands next to a table loaded with jars of peanut butter and piles of snacks destined for the Backpack Buddy program, feeding poor school children who would normally go without adequate food at home over the weekend. "She didn't have any food in the house, and didn't know what to do," Smelley said. "What do they do? What do the children do? Mothers count on them to have a big lunch at school and just stretch it until the next day. I know they're starving." In 2003, the 78th Legislature began a system-wide restructuring of social services, with food stamp privatized call centers set for a summer 2006 rollout. That rollout has since stalled. In anticipation of the rollout, the state cut 11 jobs at the Lufkin food stamp office, one of many East Texas centers to lose staff or be closed, according to a news release from the Texas State Employees Union in February. Additional staff took early retirement or left for other jobs ahead of the rollout, creating a critical low point for staff numbers in April, McReynolds said. "As a result, caseloads became impossible," he said. "When the state stuttered (on the rollout), I wanted to jerk the contract. I wasn't for doing away with our state employees in the first place." Ted Hughes, spokesman for the Texas Health and Human Services Commission, which administers the food stamp program, said the wait time is 18 days, not 40. "It's certainly not 18 days," Smelley said. "Not here ... I've seen the paperwork." Clients come to her shaky, angry and sad, Shelley said. She can tell by their hair and skin they're not eating enough. Women who appear to be in their 70s are closer to 50, bodies ravaged by hunger and hard lives. One woman in particular stays on her mind, Smelley said — a woman she described as looking "like a skeleton." State workers allegedly told the woman she would have to wait 40 days to qualify, Smelley said. Smelley said her call to the local food stamp office confirmed it. An employee there told her they were looking to hire six new people, in hopes of trimming the wait to 30 days, she said. Hughes didn't have a clear answer for people who don't meet emergency guidelines, but are still hungry. "I don't know the answer to that question. There's an assumption that they will go ... and talk with one of our caseworkers. They would refer them to a food pantry or a shelter, or they may be able to arrange for some emergency food ...," Hughes said. The food stamp office's emergency food pantry went by the wayside, the victim of short staffing, according to a former employee who asked his name not be used. "It got so overwhelming they didn't really have time to go over and pick up food to supply the pantry. It was not a state requirement, it was something we did ... just wanting to help the people," he said. Calls by The Lufkin Daily News to confirm the information were referred to Beaumont and then to Austin. Hughes said he did not have firsthand knowledge on the workings of the Lufkin office. McReynolds called for "transparency" in the system, to media and the public. He failed to get a direct answer at the local level on questions about a particular job position, he said. Two caseworker openings for Lufkin were posted on the state Web page Friday. They were listed as "temporary," expected to last six months. Applying can be so difficult, caseworkers from the Burke Center in Lufkin, an outpatient drug and mental health center, often accompany the more confused clients to the food bank, Smelley said. "Caseworkers are worried. They see how hungry people are. The paperwork just floors (clients). They're scared. We calm them down and tell them, 'You're not going to be hungry,'" Smelley said. For many of them, mostly uneducated, often homeless, wading through red tape is as mystifying as filling out a tax return for the average person, she said. And thinking the homeless will be able to use the Internet, a fax machine or make lengthy call center applications is not realistic, she said. State employees are the heroes, McReynolds emphasized, many veterans continuing to help people in need as the system rocks around them. Some employees have been hired back, and everyone is working to reduce the response time as fast as possible, he said, "even though it seems like they've been slapped by the state." McReynolds said the Legislature needs to look the system over when it meets in January, possibly throwing out the contract with Accenture, the private company hired to run the call centers. The "black hole" episode is one symptom of a system that was too much, too soon, he said. In that case, hundreds of faxed documents, including food stamp applications, were sent to a Seattle warehouse after applicants used what was an erroneous fax number on forms created by Accenture, according to a June report in the Houston Chronicle. "If you hire someone to do a job and they're incapable of doing a job, for crying out loud break the contract and go to Plan B," McReynolds said. "I was furious to hear they were rolling this thing out and no one's getting served. We're going to call them all up and we'll settle this when we get back (in session) in January." Jody Anderson, a Republican running for McReynolds' District 12 seat, said McReynolds is not looking at the larger issue. With part of the social service funding coming from the federal government, the state is fighting to catch up to new federally-mandated employment benchmarks, making it harder for Texas to meet the statistics as things are being recalibrated, he said. "I think that's why it's slowing down," Anderson said. "We would be having that whether it would be privatized or not." Trying to get the rollout online over the summer may have been bad timing, but it doesn't mean privatization itself is a bad idea, he said. "I am in favor of the most efficient way to operate state government," Anderson said. "Many times privatization is the way to do that ... once they get the kinks worked out, I think the state will start seeing the savings they anticipated." Anderson said CISC needs to be supported, regardless of anything else. "If there's a need, this community responds to it, and that goes way beyond government," he said. McReynolds said local state employees told him Friday the office needs computer upgrades and additional trained employees to trim response time. "You want somebody that uses their head and their heart for those people who are most vulnerable in this society. Until the state sorts this out, that's probably not going to happen," McReynolds said. "Eighteen days is a long time. That's kind of the bottom line." As the debate goes on, the hungry continue to stream to CISC's door. On Friday, a man suffering from hepatitis arrived. Already gravely ill and in the system for medical care, he waited hours on a call to qualify for emergency food stamps. "I truly believe this man is probably going to die. It's just a nightmare. You can get the general idea of what's happening," Smelley said. "They're so understaffed and the criteria for some of these people is so high, that an emergency to them and an emergency to the state are two different things. And that's the biggest problem." Hundreds of school children are getting more to eat thanks to the Backpack Buddy program, sending food home on weekends with students. Still, there are children in class each week across the county deemed to be "starving," she said. A look at the CISC food line, which often begins at 6 a.m. for a 9:15 a.m. opening, represents a cross section — of all ages, colors and backgrounds — of the hungry seen each year by the thousands. Smelley said every civic group, church and organization in Lufkin needs to get on board and give. "It's become too big a ministry. The whole town should be involved," Smelley said. "It's heartbreaking. I think Lufkin doesn't know what's going on." Donations to CISC go further in the form of money than food, Smelley said. The center is linked to food banks across the nation and has tremendous buying power, purchasing large loads of food for cents on the dollar. To donate, write to CISC, P.O. Box 2621, Lufkin, TX, 75902, call (936) 634-2857, or e-mail Linda Smelley at linda-CISC@consolidated.net. Ashley Cook's e-mail address is acook@coxnews.com. On September 15, an evening devoted to Hieromonk Seraphim (Rose), the late clergyman of the Diocese of San Francisco and Western America of the Russian Orthodox Church Outside of Russia, was held at the Diocesan Headquarters of Sydney, Australia and New Zealand. The event began with an archpastoral address read by His Eminence Archbishop Hilarion of Sydney, Australia and New Zealand, who introduced the main speaker, a Doctor of History, Protopriest Michael Protopopov. Fr Michael is the Dean of Victoria, Western Australia and Tasmania. He began by noting that Fr Seraphim always stressed that the main problem of Orthodoxy is not "jurisdictions" but the absence of an ecclesiastical and evangelical spirit. This is the reason that not only missionaries but Orthodox Christians in general do not taste of success in their apostolic activities. Apostle Paul long ago warned the faithful that many will not come to the Church of Christ because Christians will not live up to their high calling. For this reason, Fr Seraphim always called upon people to know themselves and not judge their neighbor. If a person sees himself in the true light, he will develop sympathy towards his neighbor, he will learn not to hate, he will learn humility, love and other good works, which are the finest means of proselytizing Orthodoxy. At the end of a lively discussion following Fr Michael's speech, many participants of the spiritually-beneficial evening proceeded to Archbishop Hilarion's church, where a pannikhida to Fr Seraphim was performed. On October 6, an event was devoted to the Orthodox Mission in Indonesia. The main speaker was Fr Daniel, Head of the Mission. Fr Daniel spoke about the successes and difficulties of his Mission and answered questions.